Intensifying the ongoing agitation of tea garden workers , the Darjeeling Terai Dooars Plantation Labour Union today threatened to call its road blockades and ‘chakka jam’ during the visit of the President and the West Bengal chief minister to the hills, from July 12 to 15. The Gorkha Janmukti Morcha affiliated trade union is spearheading a relay hunger strike from June 16 demanding clearance of workers' dues and the agitation today reached its 22nd day. The Alchemist group run Dootriah, Kalej Valley and Peshok tea gardens stand to pay dues up to Rs10 crore towards workers' provident fund, gratuity, salary and wages and other fringe benefits, while Jogmaya Tea Company and Panighatta tea estate, which are owned by other entities, have an unpaid accumulative amount of Rs2.46 crore. Today, Darjeeling MLA Amar Rai and Rohit Sharma, his counterpart from Kurseong, visited the venue of the relay hunger strike and spoke with the agitators. Tilak Chand Roka, a GJM central committee leader and legal advisor to the DTDPLU, threatened an intensified agitation to press for the workers' demand. “We will close all the tea gardens in the hills as part of our intensified agitation. We will even go for road blockades and chakka jam during the visit of the President and chief minister to the hills,” he threatened from outside the district magistrate’s office where the agitation is being staged. Banerjee will receive President Mukherjee at Bagdogra airport on July 11 and accompany him to the hills. “Our agitation has entered the 22nd day but we have yet to receive any positive proposals or assurances from the owners of the five tea gardens or the state government. The workers have lost their patience to tolerate any further,” said Roka. The threat of an intensified agitation by the trade union is contrary to what GJM general secretary Roshan Giri recently said after a meeting with K.D. Singh, the Trinamool MP who owns the Alchemist group of tea gardens. Giri had said a positive outcome was in the offing. 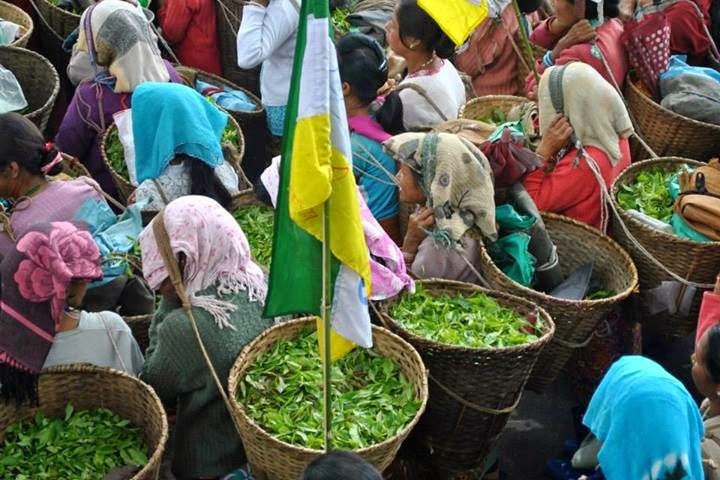 The DTDPLU legal advisor said the apathy being shown by the owners, the management and the state government in addressing the issue would affect more than 3,000 workers of the five tea gardens. “They are frustrated and in dire condition as they have not receied their salary and wages. In fact, many of them are being forced remain on empty stomachs. This is why we want the state government to show a positive attitude,” Roka said.